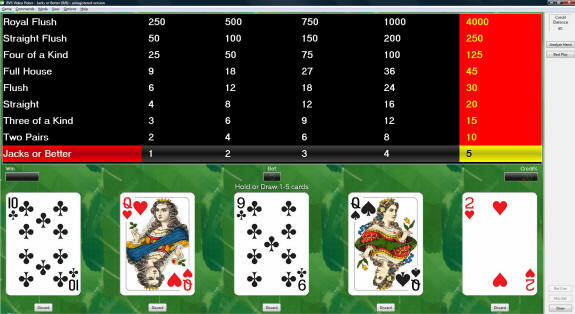 BVS Video Poker is a video poker trainer that lets you play 39 variations of games with customizable pay tables. As you play the program tells you the correct move for every single hand you see, and when you make a mistake it lets you know. BVS Video Poker isn't packed with as many features as say, Wolf Video Poker, but thankfully it is priced at only $19.95 which makes it much more affordable than most video poker programs. Also, it is available for direct/instant download. The program is set to open in full screen mode, but you can also minimize it to a more manageable size if you wish. There are three modes you can play in: Auto Hold, Auto Play, or Normal. 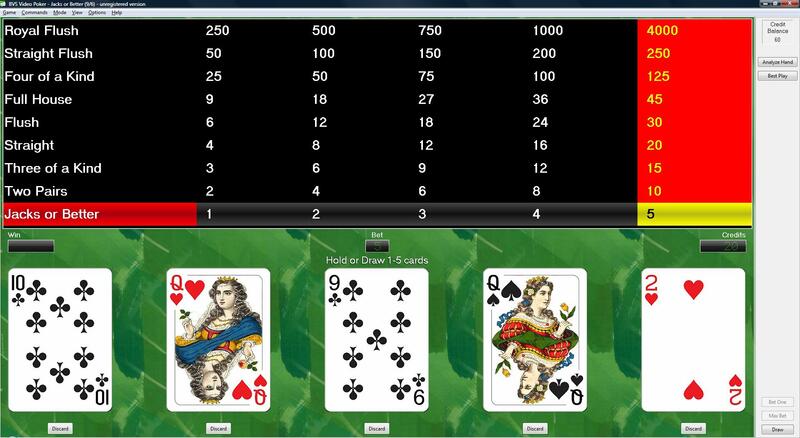 Auto Hold automatically holds the correct cards for you every hand. This can be useful for playing slowly and trying to figure out why the program is holding the cards that it holds. If you select Auto Play mode you just watch the computer play hands properly. 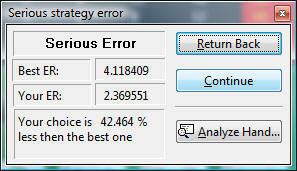 As you can see, it shows you the hold with the highest expected return. 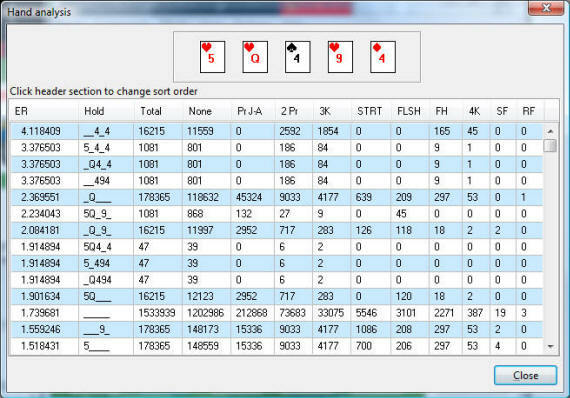 There is also a feature that allows you to analyze any five card hand you'd like. This is useful for figuring out those tricky penalty hands in weird games like Joker Wild. As I mentioned before there are 39 total video poker games you can choose from. This is a feature that was really unique, because most programs stick to only the basic games. BVS Poker offers the ability to analyze rare games such as Odyssey Deuces, Five Joker Poker, and Power House Poker. Thankfully BVS Video Poker is offered for instant download, meaning that as soon as your credit card is billed you will be able to download/play the program. Many other programs still require you to wait for a CD to arrive by mail, which is ridiculous in this day and age. Although BVS Video Poker doesn't have as many bells and whistles as some other video poker software, it has exceptional value for $19.95 that cannot be beat. I give it an A+. If you'd like to buy BVS Video Poker or learn more, head over to their site.